Remember the phrase “interactive movie” tossed around in the 1990s when games like Myst and The 7th Guest and Gabriel Knight were in the headlines? 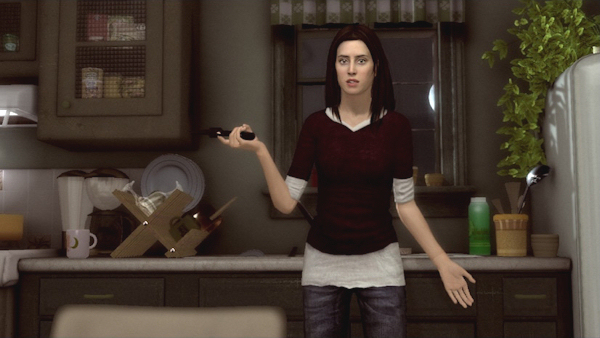 Heavy Rain, Sony’s PS3-exclusive noir murder-mystery, may be the first game worthy of what those words actually mean. As overused phrases go, “interactive movie” is a doozy, right up there with “virtual reality.” It’s also historically misleading. What we used to call an “interactive movie” looked nothing like an actual movie. Even the industry’s dalliance with full-motion video in the 1990s looked pretty awful compared to 35 mm film viewed on a standard sized movie screen. What we really meant when we said “interactive movie” was that those 1990s games were doing things in terms of dramatic sophistication that we’d never seen before in a video game. Still, you couldn’t put a realistic body much less an expressive face to a game character, a limitation imposed by the technology, until now…and a game like Heavy Rain. Bear with me, or if not me, then with Scott McCloud, the guy who wrote Understanding Comics. Very perceptive guy, Scott McCloud, whatever you think of his later ideas about digital content production and distribution. In Understanding Comics, McCloud argues that the reason comics work, is that we identify more readily with simplistic characters than realistic ones. When we see something like a smiley face with two dots for eyes and a bent-line smile at the center of a circle, the lack of detail facilitates a kind of identify transfer. We pour more of ourselves into a character rendered in plain lines because there’s so much about that character not there to fill. Add detail to the smiley face, bit by bit, until you’re looking at something an artist like Alex Ross might draw, almost photographic, and you throw up a kind of identity force field. The more someone looks specifically and uniquely human, the harder it becomes to pretend they’re you, the flip side being that your potential to relate to them empathically–and appreciate all the idiosyncrasies of their “not-you” personality–increases. In Heavy Rain, the characters look more like actual human beings than any I’ve encountered in a video game. What’s more, they sound and behave more like actual human beings, too. So far I’ve directed someone to shave, shower, dress, use the bathroom, make coffee, help carry groceries, set the table, fiddle with the living room stereo, blow off work, duel with toy swords, and give his kids shoulder rides around the backyard. I’ve also been responsible for getting another guy to bribe someone for info, console a prostitute, and hold his own in a knock-down, drag-out fist fight. I’m like a director giving cues to actors–real actors, not just cartoonish or heavily stylized approximations. Heavy Rain’s simple gesture interface increases that sense of handing out stage directions, trigged by swiveling or swirling the gamepad’s thumbsticks whenever you’re near an interactive object or individual. The consequences of those directions or “choices” affect each character deeply, and have an emotional effect on me vicariously–less like a comic book, more like a movie. Except also somehow more than a movie. Sure, we’ve seen realistic CGI-simulated humans in movies, but a film’s all received information–24 frames per second, a way to trick your brain into perceiving continuous motion. You may identify with Dr. Aki Ross in Square Pictures’ Final Fantasy: The Spirits Within, or the child in Robert Zemeckis’ The Polar Express, but you never really feel responsible for them. In Heavy Rain, you feel entirely responsible, because the choices you make alter their fate. And that’s what’s changed: You’re participating in a narrative that combines the visual plausibility of a movie with the choice-and-consequences mechanics of a video game. And you care more about what happens to these people, strangely enough, because they’re so definitively not you.